This must be one of the most asked questions amongst the Apple community. 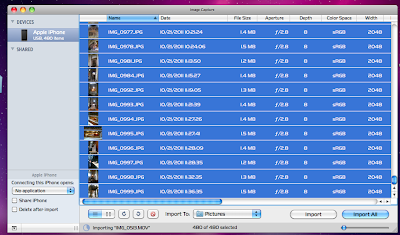 The easiest and fastest way to transfer pictures from iPhone or any other digital device to OSX is by using the Image Capture application (installed by default). Select the images or videos you want to transfer and drag them to the destination folder. On the left hand side of the screen you can also configure the default application to start whenever that particular device is connected to OSX.